If there’s one thing I love, it’s a good ole breakfast sandwich! It is so hard (impossible) to find a gluten free one so I made my own! These are INSANELY delicious and take hardly no time to make them. Make them ahead of time, wrap them up, and keep them in the fridge for a quick and easy breakfast on the run! 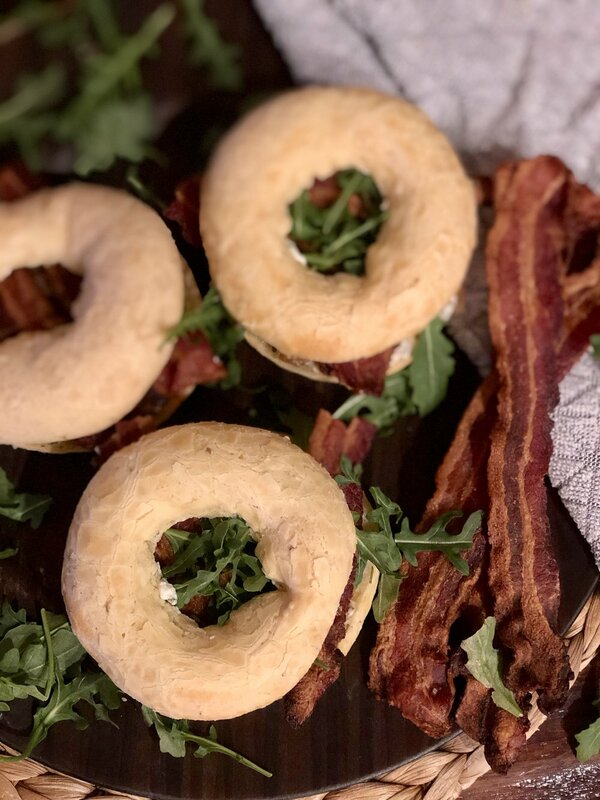 To make these Paleo and dairy free, you can make your own bagels instead of using the premade Against the Grain ones. I bought the bagels at Whole Foods. If you don’t use Against the Grain, I would recommend Simple Mills or Legit Bread Company. I like to use Kite Hill chive cream cheese style spread (made of almonds) because it’s dairy free and DELICIOUS! I think it tastes just like Boursin cheese. You can use whatever kind you like. Just because these are technically breakfast food, does not mean you have to eat them for breakfast only! The first time I made these I actually made them for dinner. They are a great option for breakfast, lunch, and dinner! Enjoy! Defrost bagels. Cook eggs in an oiled cookie cutter to keep circle shape. Cook sausage and bacon. Assemble sammies! Put 1/2t of chive spread on each side of bagel. Then add egg, sausage, 1 slice of bacon (halved), and arugula. Enjoy as is, or with salsa or more Kite Hill cream cheese!